Full comfort, jeep assisted hike in breathtaking nature. 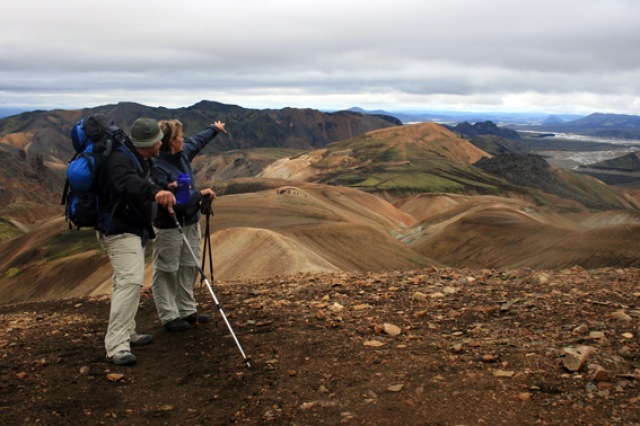 Laugavegur hiking trail is the most popular route through the Icelandic wilderness and this tour is even better as it also includes the glacier traverse from Þórsmörk to Skógar. There are very few places in the world that offer such diverse landscapes and scenic views. 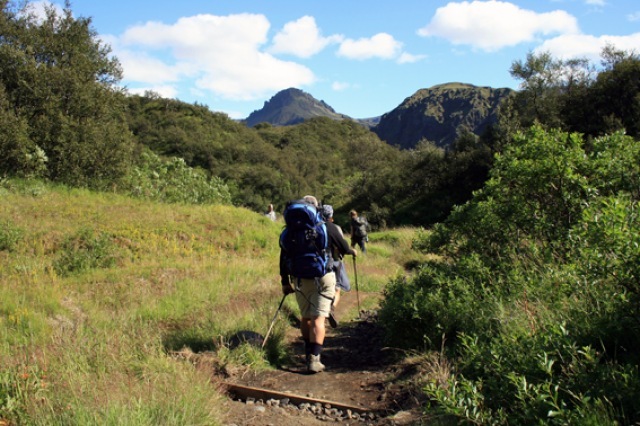 On the trek there are colorful mountains, huge and rugged glaciers, screaming hot springs, rivers of every shape and size, peaceful lakes, narrow ridges, immense waterfalls, deep canyons and panoramic views of the North Atlantic Ocean. This trek truly has it all! 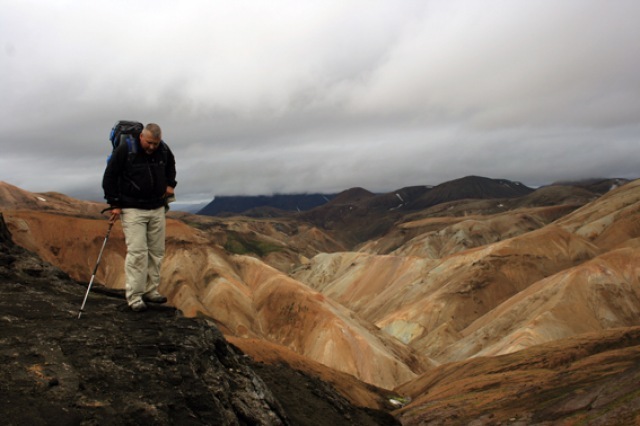 Included: Guiding, transfer from/to Reykjavík with jeep, jeep transfers food and equipment between campsites, food for 5 days (except breakfast on day one and dinner the last day), tents & cooking gear. Groups minimum 4 to maximum 14 participants. Bring with you: see equipment list. See detailed itinerary on line. The trip starts with a transfer from Reykjavík to Landmannalaugar. The journey is scenic and on the way we’ll drive past Mt. 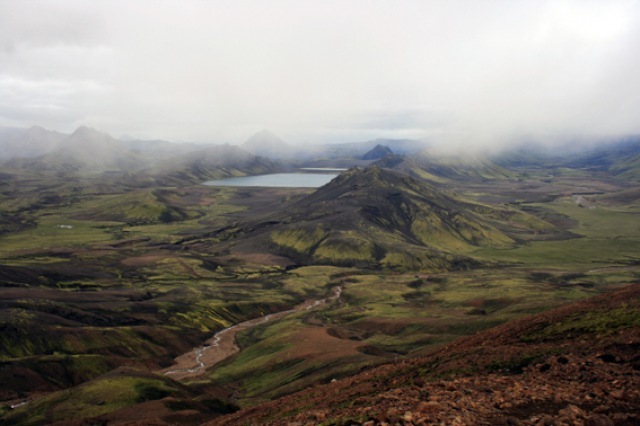 Hekla, the most active volcano in Iceland. It last erupted in the year 2000 so we’re holding our breath and soon expecting a new and powerful burst from this mountain, which has been called the gateway to hell. 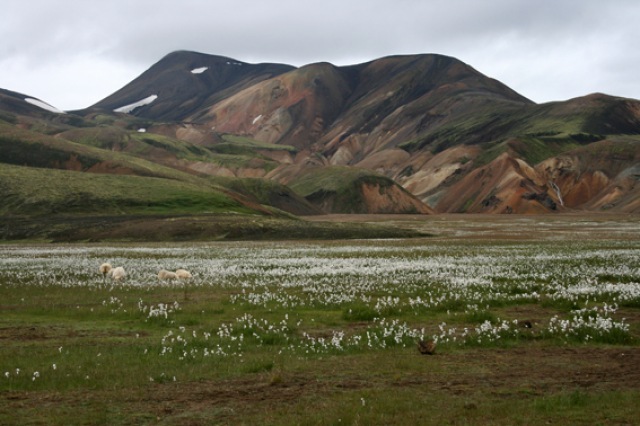 We will arrive to Landmannalaugar (approx. 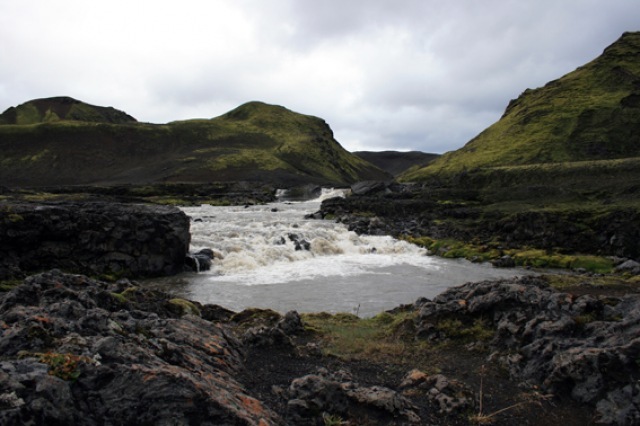 600 m above sea level) through Dómadalur route and spend an afternoon exploring the area and relaxing in the naturally warm river that runs beside the campsite. 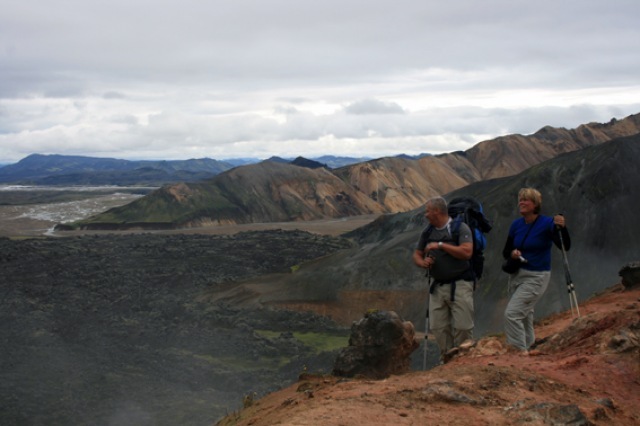 We start our Laugarvegur journey early morning in Landmannalaugar. 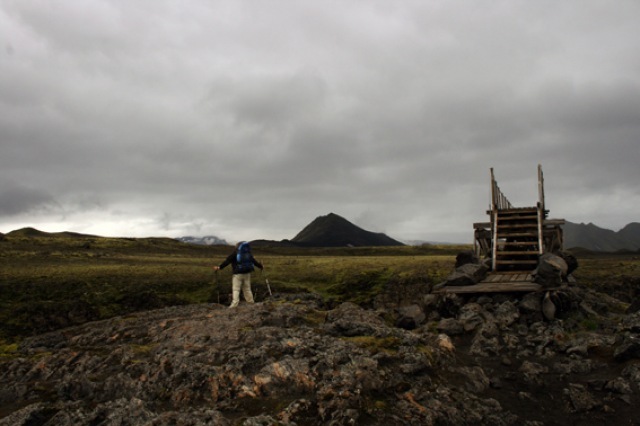 From the mountain hut by the campsite we stroll through the rough lava field of Laugahraun. From there on up the beautiful hills by the colorful mountain Brennisteinsalda and onto a plateau. The colors in this part are out of this world. 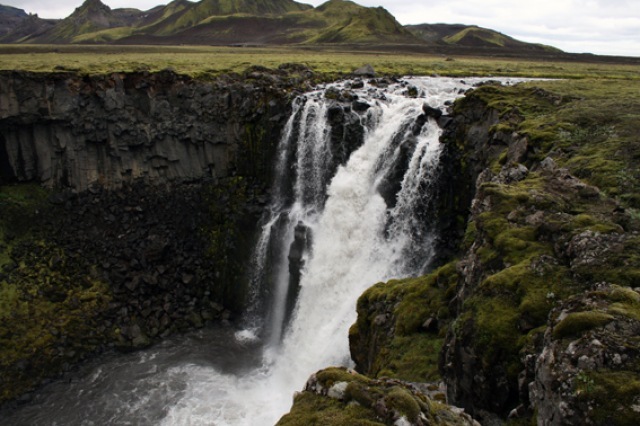 Ancient rivers and streams mark the land so we will be going in and out of small gullies quite a lot. At this point we have reached a rather high altitude and therefore you can expect snow piles that we’ll have to traverse. 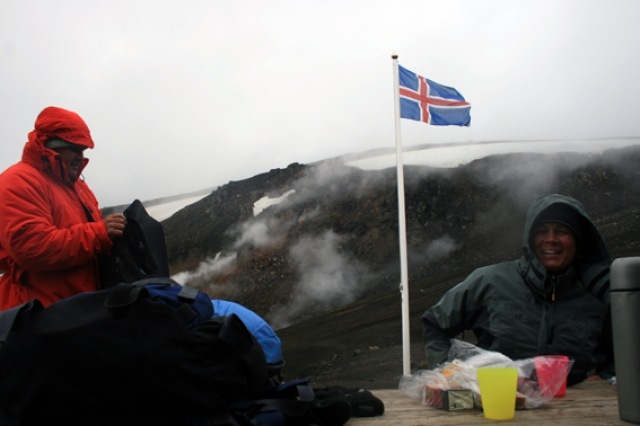 At Hrafntinnusker there is a mountain hut where we can have lunch if the weather is bad. Lots of obsidian scattered around gives the place mystic appearance. 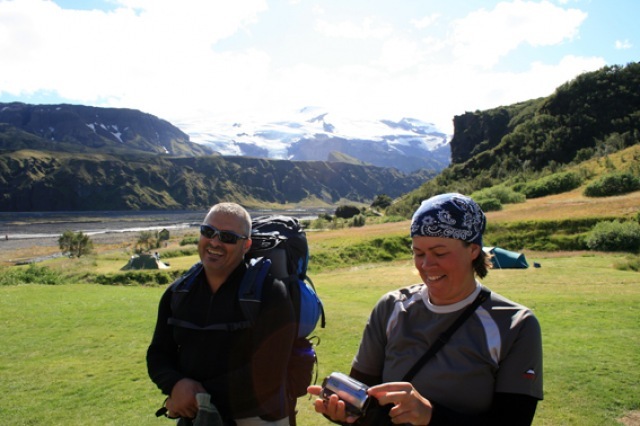 When the weather permits the views from the hut are amazing. 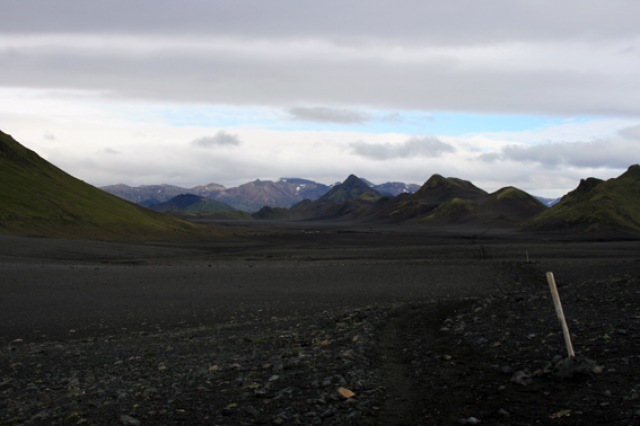 Above 1000 m there is nothing much but bare rocks and wasteland, the immense Icelandic highland desert. Along the hills of Reykjafjöll we continue walking through gullies until we get to Jökultungur. 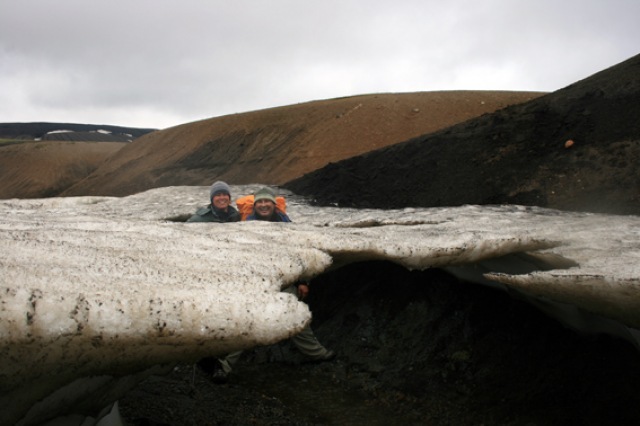 There are some changes in the landscape and we face dark tuff mountains and glaciers. We also start to see some stubborn plants scattered around. We decent down some steep slopes into a green oasis, which is a pleasant contrast after the rough landscapes behind us. 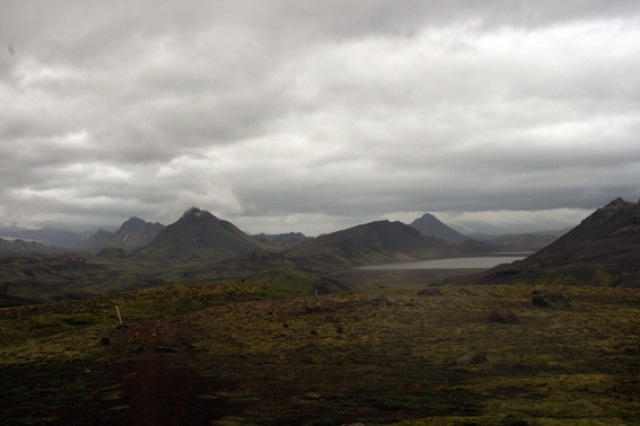 From there the walk to campsite at the northern shore of lake Álftavatn is easy. After yesterdays long journey this is going to be an easy and pleasant day. We cross Brattháls hill and head east for Hvanngil gorge. 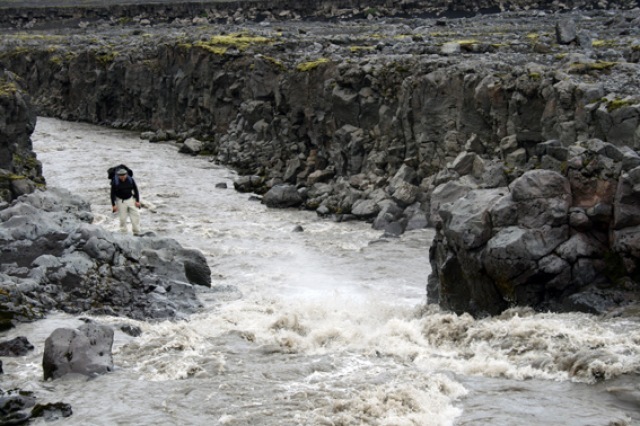 There we have to cross Bratthálskvísl River on foot. 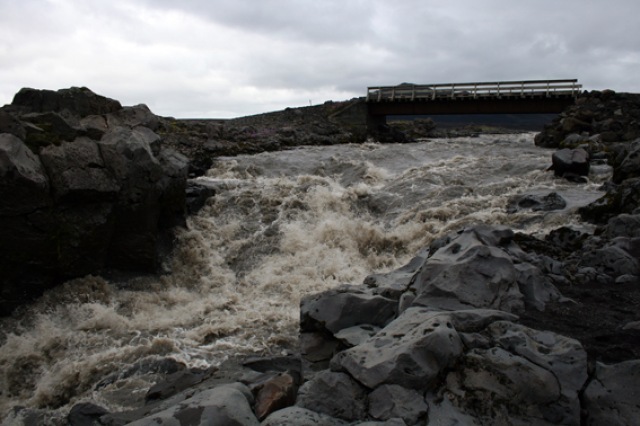 Soon after that we get to Kaldaklofskvísl that we cross via bridge. 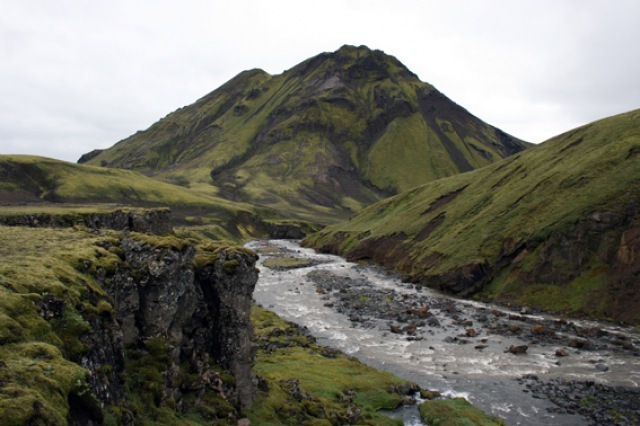 From there we head for the hut and campsite of Emstrur and on our way we cross the river of Bláfjallakvísl. Yeah, we’re sure going to give our feet a refreshing wash today. We cross between two sandy hills and soon after that we’ll see our destination for the night. 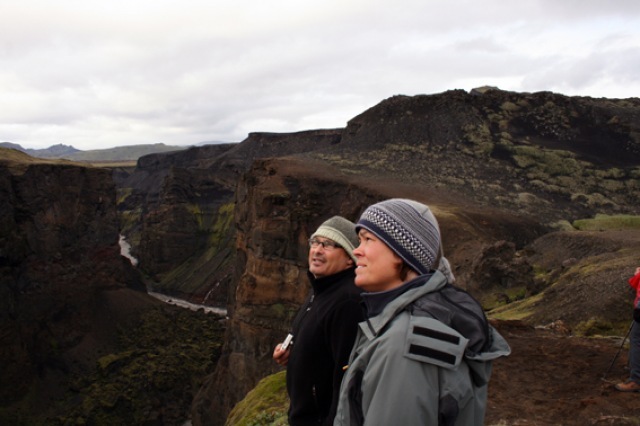 If people are up for a nice evening walk after dinner we can take a peek at the unbelievable Markarfjlótsgljúfur canyon. 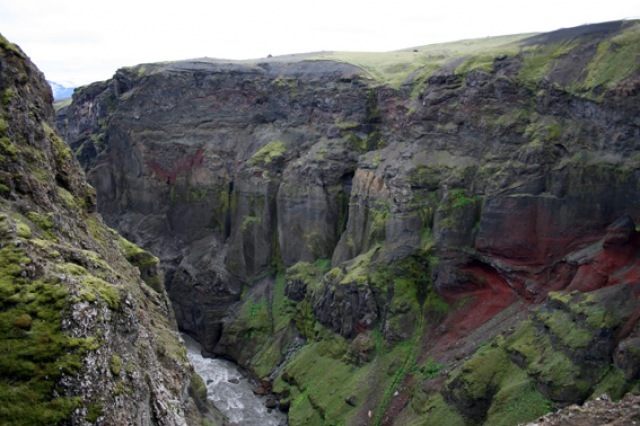 The canyon is 200 meters deep and through it flows the powerful Markarfjót River. 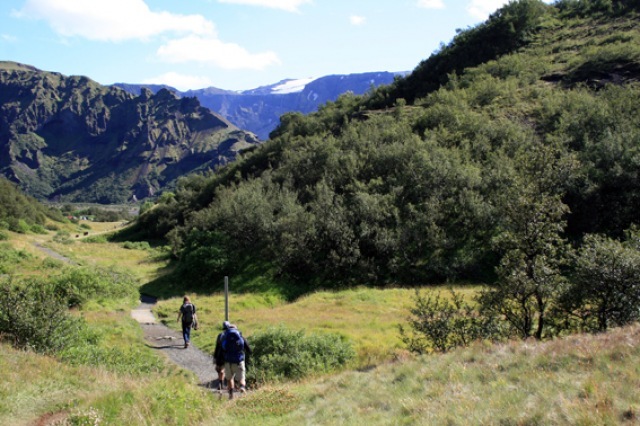 The day starts with a crooked path down to Syðri Emstruá River which we’ll cross on a bridge. While crossing the river we’ll have to be very careful, as this is one of the riskiest places on the way. 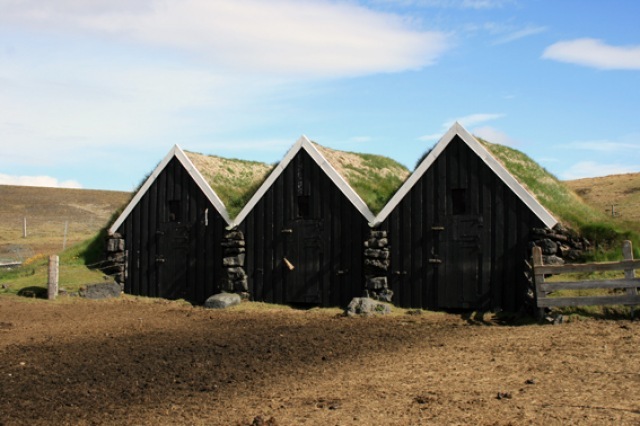 After our heroic crossing we’ll head south to an area called Almenningar. The landscape now starts to change once again and we’ll be seeing peaceful streams covered in arctic birch and flowers. 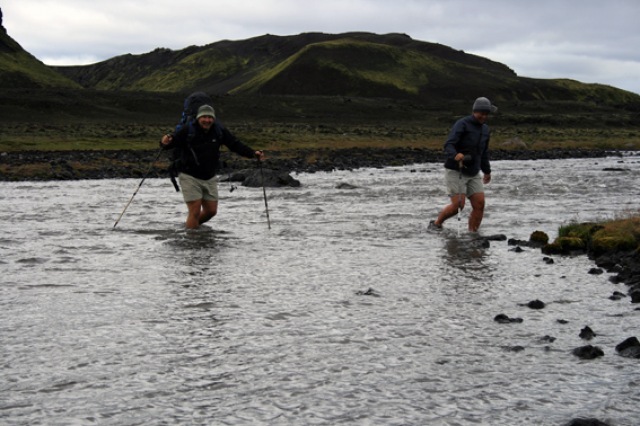 More refreshing river crossing, a bit more demanding than before (Þröngá) is necessary but that’s fine because we’ll be experts by then. 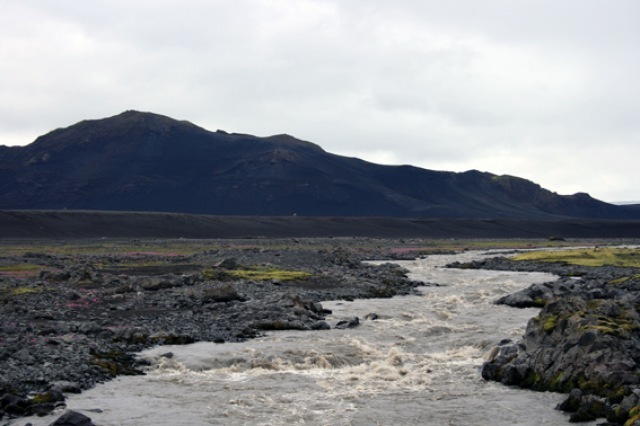 On the other side of this river we have left Almenningar behind and entered Þórsmörk valley. 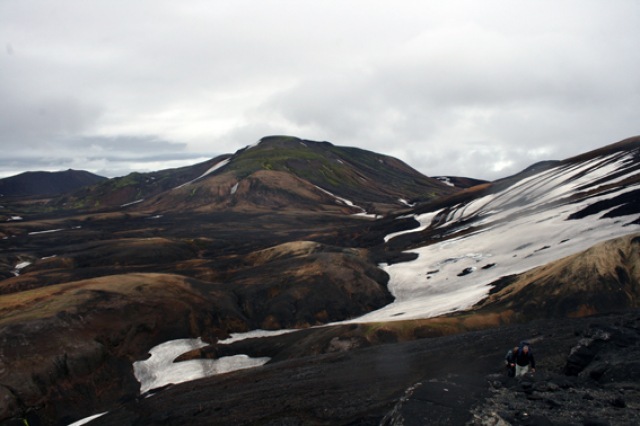 From there we have 40 min walk to Langidalur hut in Þórsmörk and from there on to Básar hut where we’ll spend the night. 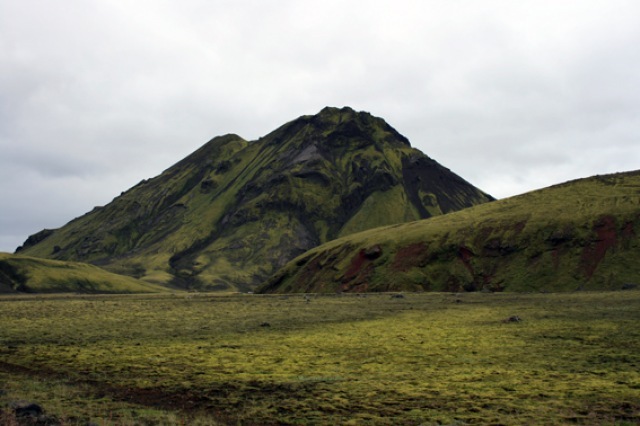 This part is wonderful as vegetation has spread over the area and Þórsmörk is undeniably one of the pearls of Icelandic nature. This will be the last day of the hike but not the easiest one. 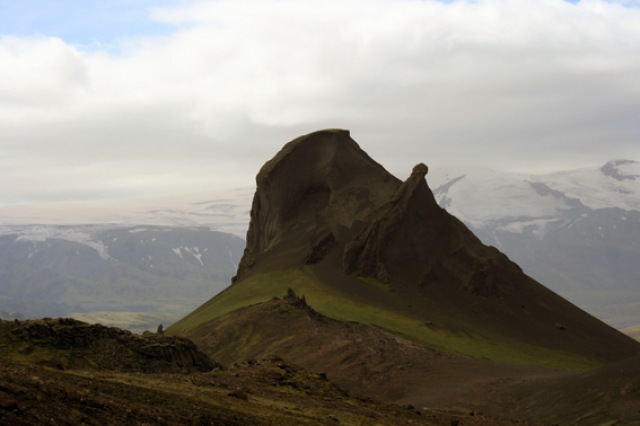 We’ll head up from Básar, into tuff mountains that are strangely shaped by weather and wind. 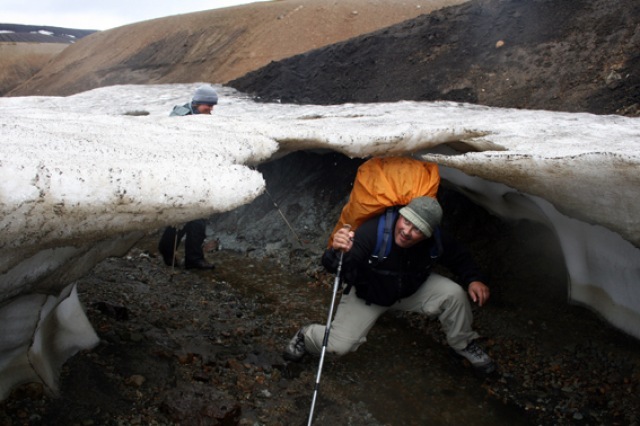 We’ll cross between two glaciers, Eyjafjallajökull and Mýrdalsjökull. 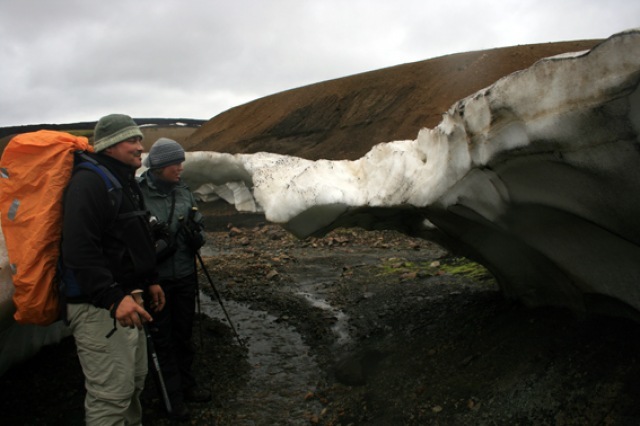 Odds are that we’ll find snow on the way and in places we’ll walk along spectacular narrow ridges. 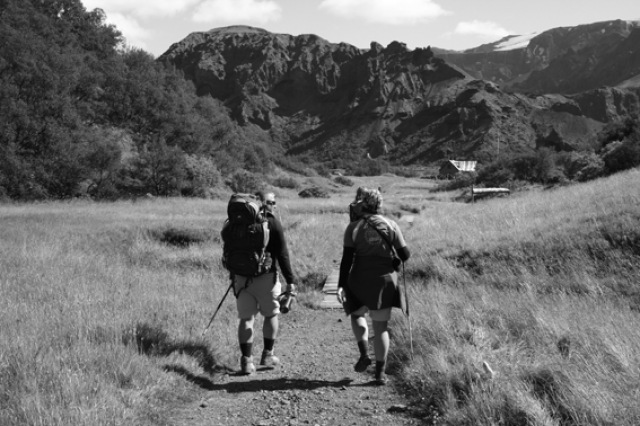 When we reach the highest point we’ll start descending towards road number one and weather permitting we’ll be able to see the South coast of Iceland and the North Atlantic Ocean. 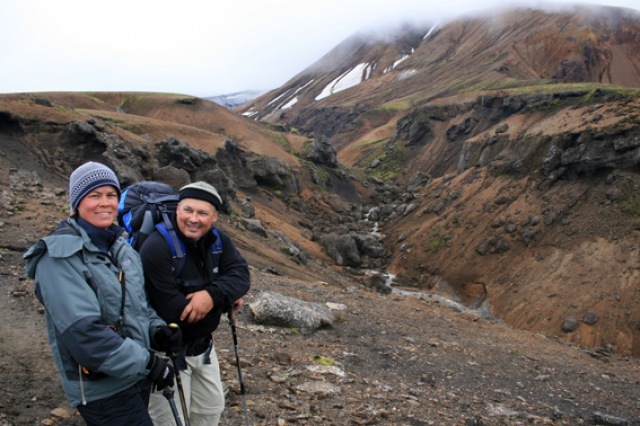 The end of the trek is marked by Skógafoss waterfall that is certainly one of the highlights of any trip to Iceland. Once we’re in Skógar we’re back to civilization and ready to head back to Reykjavík.